Happy April Fool’s Day! I’m not much for hoaxes, but a nevertheless, a light-hearted post seems appropriate. And so here’s some udder-ly a-moo-sing, bovine-themed advice on finding a cash cow for your law firm. And remember, you herd it here first. 1. The Purple Cow The Purple Cow was the first Seth Godin book I ever read which teaches how the secret to a successful business is figuring out what makes your services unique and remarkable . Remarkable isn’t a term we often hear used in connection with lawyers – so there are wide open pastures for lawyers looking to fill that space. Can you make your firm remarkable based on achieving incredible results? Delivering service in a way that no other lawyers do? If you can find your company’s purple cow, you can convert those services into a real cash cow for your firm. 2. Why Buy the Cow? Virtually every woman of my generation is familiar with the rather sexist adage why buy the cow if you can get the milk for free? (click the link if you can’t figure it out on your own). 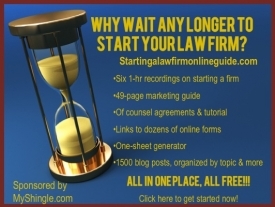 The same motto often comes up when a discussion amongst lawyers turns to blogging, ebooks or other methods of dispensing information free – invariably several lawyers will wonder whether clients will hire them if they offer advice or forms at no charge. But just as there are many more benefits to buying a cow than just free milk, there are lots of benefits that lawyers offer besides just forms. Lawyers can advise clients on how to fill out those forms, and defend clients when agreements memorialized by those forms fall short. Sometimes free is also necessary to educate clients – if you don’t explain to clients why a will or trust is important or how to figure out if their rights have been violated, they may not even realize that they have a case. Maybe using free to attract clients to your firm may turn out to be your cash cow. 3. No Sacred Cows. Lawyers have so many reasons for why a particular idea won’t work. Lawyers may argue that subscription services are unethical or that a virtual practice won’t work because clients won’t trust using it or that focusing on a niche market will prove too narrow and you’ll lose clients. The list goes on and on. When it comes to success – in law or any other field – there are no sacred cows. Leave no assumption unchallenged, no supposed-truth untested. If you have an idea that excites you, do your own diligence to determine whether it might be your firm’s cash cow.